Happy Sunday to you all, I can't believe we are already into March! Today's card was made awhile ago but I'm just now getting around to sharing it. Perhaps you remember the stenciled Birthday card I posted over a month ago using a diagonal stripe stencil and distress inks, you can check it out HERE. I made today's card using the remaining piece of the stenciled design that I cut off when I made the birthday card. 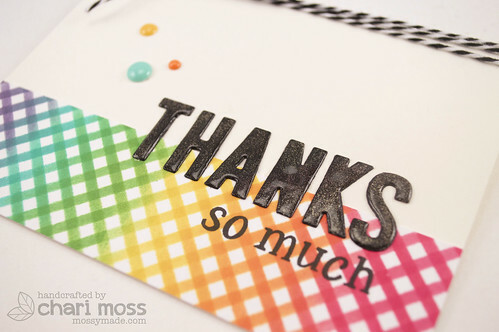 The "THANKS" part of my sentiment is die cut using Cole's ABCs lawn cuts from Black card stock. After adhering them down straight I gave them two coats of Wink of Stella glitter than a coat of Glossy Accents. I used Riley's ABCs stamps to complete my sentiment and embellished with some enamel dots and black and white twine. Oo bright and cheerful, so cute! This card is amazing! Really love it. This is so pretty. 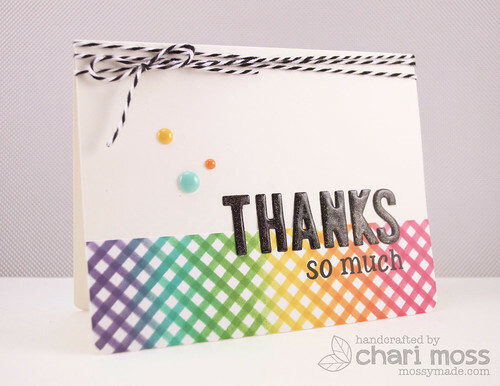 Love the fun stamping at the bottom and the colors you used.